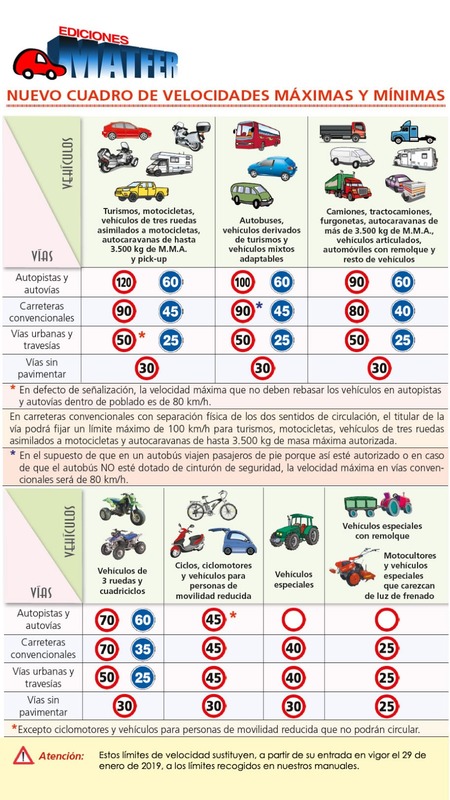 As of today, January 29, many maximum speed limits on the roads of Spain change. The General Circulation Regulations are modified … and also the fines. Here you have all the details. They are already here. As of today, January 29, all the new speed limits that the Government approved in the Council of Ministers on December 28th come into force. Thus, the amendment of article 48 of the General Circulation Regulations provided for its application to be made 30 days after its publication in the Official State Gazette. And that day has already arrived. So do not be surprised by any new limit, we review today in this complete article all the changes and how the changes affect you. In addition, we accompany the information of several graphs so you can check, at a glance, what the new speed limits are by type of vehicle and road. The main novelty is, starting tomorrow, the new speed limit reduced to 90 km / h on conventional roads for cars and motorcycles, maximum record that will remain at 80 km / h for the rest of vehicles (trucks, buses, caravans, school transport, vehicles with trailer …). Yes, the DGT confirms the DGT confirms that cars and motorcycles may exceed the speed limit by up to 20 km / h when overtaking, provided that the previous car already circulates below 90 km / h. That is to say, as a maximum we can advance to 109 kilometers per hour, since the advance vehicle has to always circulate as we have said below 90. However, this reduction to 90 km / h will not happen in all conventional roads: in those with physical separation of the two directions of circulation the law allows the holder of the road to fix a maximum limit of 100 km / h for cars , motorcycles and motorhomes with maximum authorized mass equal to or less than 3,500 kg. That is, although the generic limit set by the law is 90, you will find certain conventional roads where you can continue to circulate to 100. You will recognize them because both directions have to be physically separated and because they will leave the signals of 100. HOW MANY KILOMETERS OF CONVENTIONAL ROADS WILL AFFECT THIS CHANGE? In total, more than 60,000 kilometers of roads are affected from tomorrow by the new measure. According to the DGT, the modification of the generic limits on conventional roads for cars and motorcycles from 100 to 90 km / h affects about 10,000 kilometers of roads, although, as confirmed by Mario Arnaldo, of European Automobile Associate, this figure refers only to the State Highway Network. To her, it would be necessary to add the kilometers of the conventional roads of the Autonomous Communities and of the councils and councils. In total, according to Arnaldo, more than 60,000 kilometers of secondary roads will change their maximum limits. In no case is the entire network because those with a shoulder less than 1.5 meters already have a maximum speed limit of 90 or less. The current speed limit of 100 km / h was established in Spain in the 1980s, at a time when the network did not have many kilometers of high-capacity roads. Now, this change equals us with countries like Italy, France and Portugal, where these 90 km / h are established at most. In contrast, in Germany or Great Britain, the maximum limit is still higher. And other countries, as you will see in the chart below, still have a higher speed restriction. WHAT CHANGES IN THE REST OF VEHICLES? On the other hand, there are few changes in the maximum allowed speeds of the rest of vehicles. The modification of the approved Traffic Regulation now does not modify the maximum speed of the rest on conventional roads. Buses, vehicles derived from tourism and adaptable mixed vehicles will continue to be able to circulate at 90 km / h, while trucks, tractors, vans, motorhomes with a maximum authorized mass exceeding 3,500 kg, articulated vehicles, cars with trailers and other vehicles will do so at 80 km / h.
It is also established, for the vehicles that carry out school and children transport or that transport dangerous goods, a reduction in 10 kilometers per hour of the maximum speed fixed based on the type of vehicle and the road through which it circulates. In the event that passengers travel on foot, the maximum speed will be 80 km / h.
One of the important aspects of the modification of the General Regulation of Circulation that now comes into force is that the speed difference between passenger and merchandise transport vehicles is reduced with respect to cars and motorcycles. According to the DGT, the EU countries with the lowest death rates per million inhabitants in traffic accidents have a differential between heavy and light between 0 and 10 km / h. In addition, the DGT argues, according to various studies, that vehicles that circulate at different speeds of the average of the road, such as trucks with respect to cars or motorcycles, are more likely to cause an accident with a probability 6 times higher that if they circulate to the average of the rest. From Traffic say that this change unifies the speed of trucks on roads at 80 km / h, common limit in most countries of the European Union. Since the entry into force of the new General Circulation Regulations, driving above 91 km / h on these roads will entail a penalty of 100 euros once the corresponding margin is applied depending on whether the measurement is made with a mobile radar – in those below 100 to 7 km / h and above 100 of 7 percent- or with a fixed radar -of up to 4 km / h in measurements below 100 and of 4 percent in measurements above-. The loss of points will also now come from 121 km / h, instead of the 131 km / h as it happened until now, which will be two at speeds up to 140 km / h, while from now on it becomes a circular offense by secondary roads above 170 km / h (80 kilometers per hour more above the maximum limit) in the sections with generic speed. The modification of the General Regulations of Circulation also includes another important novelty. From tomorrow, on unpaved roads, a new maximum speed limit is established. In particular, a new paragraph of the text now establishes that in all the unpaved roads, that is to say on generally dirt roads, it will be possible to circulate at a maximum of 30 km / h.
WHAT IF THE SIGN OF 100 HAS NOT CHANGED AND WE HAVE FINANCED? CAN WE RECOVER? In order that the owners of the roads can proceed to the change of signaling on the affected roads -Both Development as the autonomous communities and councils and councils-, the modification of the Regulation granted a month from its publication in the Official Gazette until its entry in force. However, and despite the fact that the DGT assures that today, January 28, the last limit signal of 100 to 90 km / h has been changed in the State Roads Network, there is a possibility that they have not changed all in the communities and continue to find signs of the previous limit, 100 km / h. What would happen if we were fined on a stretch with a signal of 100? Would it be actionable? In this case, the fine would be actionable, as Mario Arnaldo, president of Automoviles Europeos Asociados, tells us. Thus, article 47, which has not been amended, establishes that “the owners of the road shall fix, by means of the corresponding signaling, the specific speed limitations that correspond according to the characteristics of the section of the road. In the absence of specific signaling, the generic established for each route will be met “. According to Arnaldo, in section 1 of the modified article, 48, it is stated that “the maximum speeds that will not be exceeded are the following …”, but the tagline “in no case” necessary is not added so that there are no exceptions . Therefore, it is understood that there would be room for a resource. In addition, in article 52 of the Regulation itself, which has also not been modified, we speak of “prevalent speeds” and in the first section it is stated that the maximum speeds indicated will prevail those that are set “through the corresponding signals”.